2008 saw probably the most fierce arrival of winter in recent decades. Extremely heavy blizzards caused havoc on the roads and were the triggers for many accidents. People were snowed in their homes and couldn’t get to work. Too bad that I was sitting in an eagle hide in Norway :(. Not that I didn’t get amazing pictures, because the storm had painted also the mountains white and made eagles fight for food, because every natural food source was covered by snow. So when I got back to Estonia the first snow had already melted and caused heavy over flooding. Even in the forests. 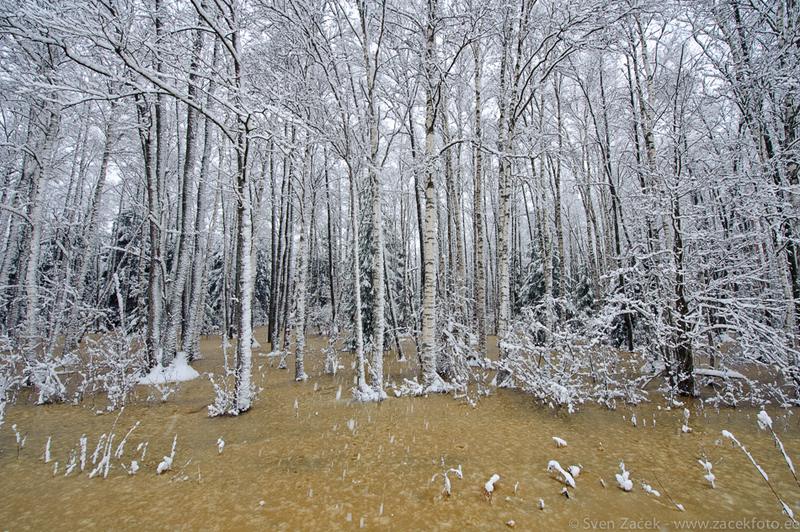 So in this picture you see the remnants of the first snow as the water underneath the birch trees and the second snow that has painted the water yellow.